When a scandalous small-town crime goes viral, a teen girl takes center stage in the story of a twenty-first-century Puritan witch hunt. The Last Kid Left begins when a car smashes into a sculpture of a giant cowgirl. The police find two bodies in the trunk. Nineteen-year-old Nick Toussaint Jr. is arrested for murder, and after details of the crime rip across the Internet, his sixteen-year-old girlfriend, Emily Portis-a sheltered teen who's been off the grid until now, her first romance coinciding with her first cell phone-is nearly consumed by a public hungry for every lurid detail, accurate or not. Emily and Nick are not the only ones whose lives come unmoored. A retired police officer latches on to the case. Nick's alcoholic mother is thrust into an unfamiliar role. A young journalist who left her hometown behind is pulled into the fray. And Emily's father, the town sheriff, is finally forced to confront a monstrous secret. 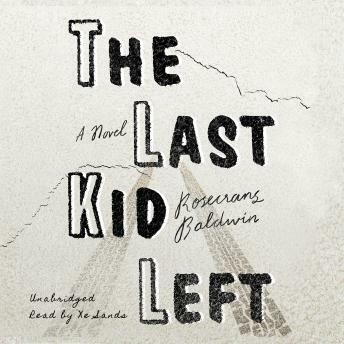 The Last Kid Left is a bold, searching novel about how our relationships operate in a hyper-connected world, an expertly portrayed account of tragedy turned mercilessly into entertainment. And it's the suspenseful unwinding of a crime that's more complex than it initially seems. But mostly it's the story of two teenagers, dismantled by circumstances and rotten luck, who are desperate to believe that love is enough to save them.